Ai letz U keep yer sole….until teh kibblol runz aowt. When teh kibblols run owt, someone will walk teh plank. Iffn dat izn’t a krime wervee uv teh ‘wawk teh plank’ PUNishmint, Ai dunno wat iz! Ai wuld cawl teh conga ratz tu dans, but dey are awn tehre pi rat ship chaysing teh toona fleetz. Aye!! As it shood be! Luuk at awl teh shiney!!!! Ahoy thar, ye scurvy daw… … erm, kitteh! I claim that thar treasure in the name o’… ME! Now hand it over before I gut ye like a fish! Arrr!!! Sawry, did sum crew member menshen FISH ?? Ohai PB! Laik ur pi rate hat! Sadlee, de fevvers yoosd tu be de parrit-frend ob de ryval pyrat Oranjj Poysin. Aarrh, me harteez! Mornin/ ebnin/watebber! Ahoy maytee! Thx fur teh congas! Fanks fur de capshun, Anni!!! Dis is de Dredded Dark Dot, scurge ob de libbin ruum. Thx Muchcat – Ai seed teh pikchoor an teh capshun praktiklee ritid itselb! P.S. Iz a lubblee pikchoor uv a byootimuss kitteh! O fankew. Dredded Dark Dot adn hur crew wer nawt innerestid in de dubloons atawl. Dey alsew nawt-sew mutch innerestid in de purls adn roobies adn gowld (must hab noed nun ob it was reel -pyrits habs a noes fur dat). Avast, Captain Anni! I be admirin’ yer avatar! 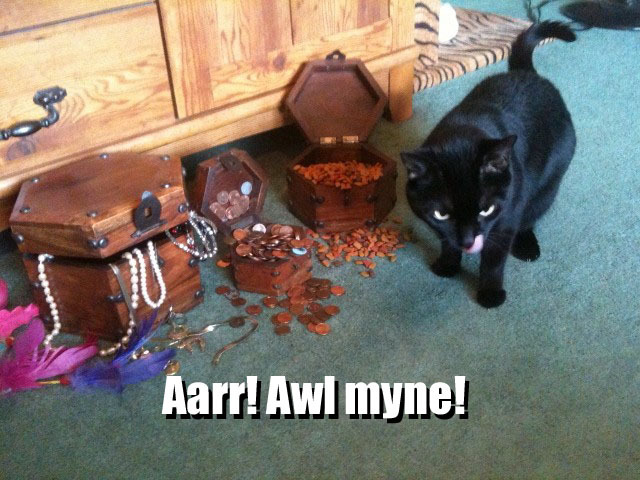 Also, ARR me MuchCat Matey! I be admirin’ yer picture! Awais a pleshur tu meet, oar re-meet, fellow cheezpeeps! Ahoy me hartee! Thx fur teh approobin uv mai drorin!